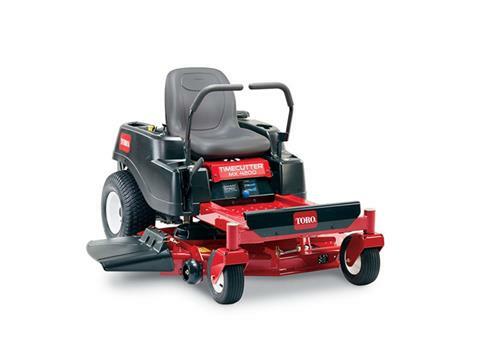 The TimeCutter MX4200 zero turn lawn mower is powered by a 22.5 hp Toro® Commercial V-Twin 708 cc engine with Self-Cleaning Air Filter Housing. It features a 42 in., 10 gal. steel fabricated cutting deck with bull-nose bumper and convenient washout port. With great features like our exclusive Smart Speed® control system it allows you to choose from 3 speeds giving you greater control when trimming, towing attachments and mowing. BUILD YOUR PERFECT ZERO-TURN MOWER: Build your perfect zero-turn mower with the Toro® Custom Z-Builder™. Design your Z by choosing the steering, platform, deck, engine, seat, and many more custom options. It will be hand delivered with options and accessories installed. HEAVY DUTY REAR ENGINE GUARD: This heavy-duty steel guard protects the engine from branches and debris as you maneuver around your lawn. 3-GALLON (11.4 LITER) FUEL CAPACITY: All TimeCutter® riding mowers feature a large 3 gal. (11.4 l) fuel tank for more mowing with fewer fill-ups. Knowing when to fill up is simple thanks to the translucent tank, which also helps to prevent overfilling. SAVE ON AVERAGE 45% OF YOUR MOWING TIME: The Toro TimeCutter cuts your mowing time almost in half*, which means less work for you and your mower. You’ll not only have more time to enjoy, you’ll extend the working life of your mower. Watch our video to see how you can increase your productivity. *Time savings by yard size are from 2008 – 2012 survey results for Toro residential zero-turn mowers, as reported by owners. *Time savings by yard size are from 2008 – 2012 survey results for Toro residential zero-turn mowers, as reported by owners. 18 IN. EXTRA TALL SEAT: When you're mowing for an extended period, there's no substitute for a good seat. The 18” extra tall seat offers permium support during longer mowing sessions. The gross or net horsepower ratings of these engines were laboratory rated by the engine manufacturer in accordance with SAE J1940. As configured to meet safety, emission and operating requirements, the actual engine horsepower on these mowers may be significantly lower.